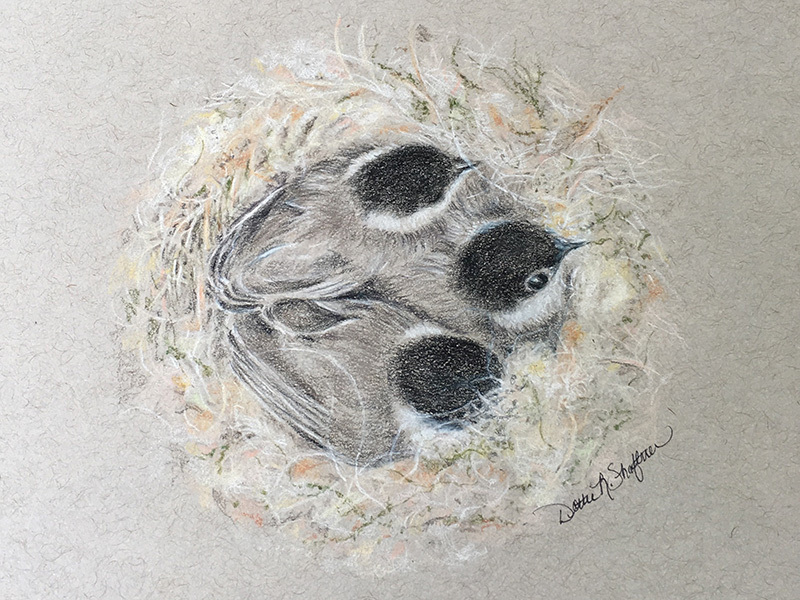 (RALEIGH, N.C.) — The North Carolina Museum of Natural Sciences’ Nature Art Gallery presents “Feathers and Fluff,” artwork by Dottie Shaftner. The show runs April 5-28, with a Gallery reception Saturday, April 6, 2-4 p.m. All exhibited art is for sale. Shaftner’s work reflects her love of nature and its beauty. “Drawing and painting is like breathing,” she says. “Some days it just pours out of my heart, through my fingers and on to the paper. I can’t help it. This is who I am. Recreating what I see in nature brings me joy. If my work does the same for others, I am happy.” Eager to hone her talents and skills, Shaftner enrolled in every available art course during her high school and college years. She earned a degree in Graphic Design, but fine art was her true love. She sought out private instruction in pastel and watercolor. Her most recent work is done with colored pencil. Teaching art students at all grade levels in private schools, as well as in her home studio, has added to Shaftner’s broad range of professional experience. She has worked as a graphic designer, freelance artist and set designer and is comfortable working in various media. She is also a member of Clayton Visual Arts, and her work can be seen at 311 Gallery in Raleigh as well as businesses and homes across the country.